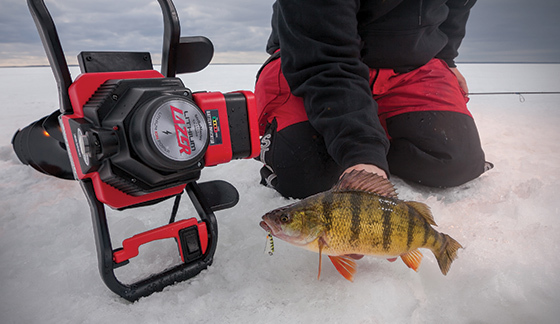 Our ice fishing blog is packed with all the latest hardwater information. Get current fishing reports and ice fishing tips written by our Pro Staff. Be the first to read news, watch videos and more. Don't miss out! Sign up to get the latest from our signature ICE FORCE brands. When your job is to help more than a dozen clients catch fish through the ice, you can’t cut corners. But you can cut all the holes you need with a StrikeMaster Lithium Lazer™ — an electric auger. On a busy day, Hawthorne will find fish for as many as 28 clients in 14 portable Otter ice shelters. In each shelter, at each location, he drills four holes — two per anglers for jigging and dead-sticking. Depending on the bite, he might move each shelter numerous times a day. Each relocation requires four new holes. And even with Upper Red Lake’s ice measuring from 12 to 16 inches thick in the last couple weeks, 80 holes a day is no problem for the StrikeMaster Lithium Lazer. Harnessing the most modern technology available, StrikeMaster’s Lithium Lazer auger can cut an impressive 56 holes through two feet of ice on a single charge. Other Lithium Ion-powered augers boast only 40 holes in 24 inches of ice. With a removable 50-volt Lithium Ion battery under the hood, the Lithium Lazer provides consistent speed and torque from hole to hole without reduced power or slow-down from waning battery. Featuring an on-board indicator for easy battery-level checks, it comes with a fast-charging, two-amp battery charger. The convenience factor is amplified when you factor in weather. When working with a gas-powered auger, you generally drill your holes before you set up your portable shelter, standing outside, exposed to the elements. But because an electric auger creates no exhaust, it’s no bother to drill inside your shelter, out of the breeze and freeze. Drilling inside with a Lithium Lazer is also easier on your portable shelter’s walls, seats, zippers and other components. “To be able to drill inside the Otters when they’re set up without having to worry about oil and gas spraying all over is absolutely huge,” Hawthorne says. No half-pint trick pony, the Lithium Lazer is a bonafide workhorse — a true, full-size drill. Because you won’t have to hunch over when you punch holes, you won’t get a sore back using it and you won’t need an auger extension for normal operation. VANDAR long-filament high-impact handles make for comfortable operation for anglers who spend long days on the ice. An over-sized throttle makes the Lithium Lazer easy to operate with gloves on. Built on a proven StrikeMaster American-made 25:1 transmission with heat-treated steel gears and polymer gear castings, the Lithium Lazer delivers maximum efficiency with a lighter weight than ever before. When fitted with twin 8-inch, Swedish-made Mora stainless steel Lazer blades, the Lithium Lazer weighs in at only 24 pounds. Accessories or replacement parts could be hard to find or inconvenient to order for any other battery-powered auger, but not for a StrikeMaster Lithium Lazer. “There’s no ‘special parts’ on that auger, so I don’t need to worry about finding replacement blades or anything,” Hawthorne explains. “StrikeMaster’s 8-inch blade is the most common blade found anywhere. I can find it at gas stations up here, and pretty much any sporting goods store in the Ice Belt — from the smallest bait shop to the biggest retailer. If I happen to lose a bit, anything like that, I can find those parts. “It’s a comfort knowing that if I go to Lake of the Woods and I need a set of blades, I can get them; if I go to southern Minnesota or North or South Dakota, those parts are going to be there,” Hawthorne continues. A limited three-year warranty on the motor and a limited one-year warranty on the battery provide additional piece of mind. This entry was posted in Products, Tips and tagged Brad Hawthorne, Lithium Lazer, StrikeMaster. Bookmark the permalink. ©ICE FORCE 2019. All rights reserved.